A manufacturer of medical devices approached Sipe Steel Rule Die, Inc., with a specialty project that would require die making as well as die cutting. The product required was designed for use as a mat with fingers, which would support medical instruments during a sanitizing process. The customer supplied the engineering drawings, which were used to fabricate the dies. The drawings also called out the use of a smooth medical grade silicone mat, with finished dimensions of 14.839" in length, and 9.26" in width. The die cutting was performed on our precision Atom S530 CNC die cutting press to tolerances of ±.030". In addition to the die making and die of the perimeter and hundreds of holes, this product also requires weeding, or scrap removal. Mats were cut in lots of 1 to 100 with typical lead times of 72 hours; this product is widely used in medical and orthopedic applications. The process of CNC die cutting is primarily for industrial customers who have sheeted products to be cut. For more information, see the table below or contact us directly. 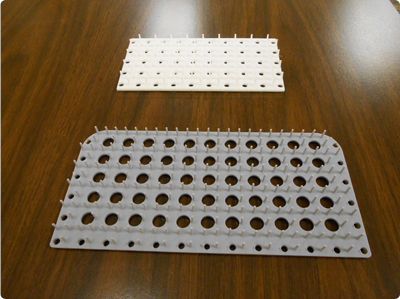 This mat is used to support orthopedic medical instruments during sanitizing. Made according to customer supplied blueprint.